You can meet friends and watch the latest movies here. You can also play arcade games. They sell light snacks like popcorn, hot and cold drinks, chocolate and ice cream. There is a bar upstairs outside screen 1. Alcoholic drinks can only be drunk in the bar upstairs. There is an accessible bar nearby, click here to find out about the Halfmoon Theatre bar. The cinema opens at different times because the movies are shown at different times. It is usually open between 1.00 pm and 2.00 pm on Mondays, Tuesdays, Wednesdays, Thursdays and Fridays. On Saturdays and Sundays it is open by 12.00 midday. Click here to see what movies are now showing. To book tickets before you go call 0207 780 2000. You can also listen to a tape of which movies are playing. If you want to go as a group please call 0207 780 2008. The Box Office is open everyday 15 minutes before the first movie. The standard concession price is £3.65. On Wednesdays it costs £3.80 for everyone. If you go to see the first movie of the day on Mondays, Tuesdays, Wednesdays, Thursdays and Fridays it only costs £1.50. P.C World shopping complex is next door. There are no spaces saved for people with disabilities. Some customers park in the P.C World car park next door. 25 is the nearest mobility bus. (District Line, Hammersmith and City Line) Stepney Green station is about 520 metres from the Cinema. Stepney Green station is not accessible for wheelchair users. (District Line, East London Line, Hammersmith and City Line) Whitechapel station is about 700 metres from the Cinema. Whitechapel station is not accessible for wheelchair users. Limehouse station is about 1300 metres from Genesis Cinema. It is fully accessible for wheelchair users. Bethnal Green mainline station is about 1175 meters from the cinema. It is not accessible for wheelchair users. Doors are usually kept open, staff can see you from the box office. There are chairs in the main hall by the box office if you find it difficult to stand and queue. There is wheelchair access to the four smaller Screens 2, 3, 4 and 5. There is a stair lift, the door is 750mm wide. Or there are a few steps with a handrail. There are 75 steps up to the next floor to get to the bar and Screen 1. There are more steps to get into Screen 1. 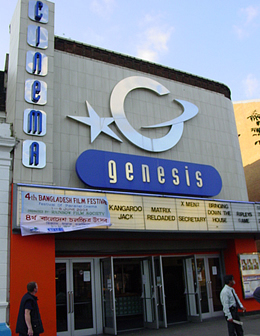 Genesis show their movies on different screens at different times. All movies are shown on Screen 1 first, then they are shown on Screens 2, 3, 4 or 5. There is an accessible toilet in a unisex area on the ground floor. The smallest doorway is 870 mm wide. The alarm was working on our visit. The staff are friendly and have time to help.